Traffic on I-77 near Exit 30 at Davidson. By Dave Vieser and Dave Yochum. Just when it seemed as if the state has hemmed and hawed as much as it can on the I-77 toll lane debacle, the NCDOT is putting together a new advisory group “to learn the advantages, disadvantages, costs and timelines” of the options presented this fall by Mercator Advisors, the consulting firm hired to look at how we entered into a 50-year contract with a Spanish company. “I welcome the establishment of the Governor’s I-77 advisory group. 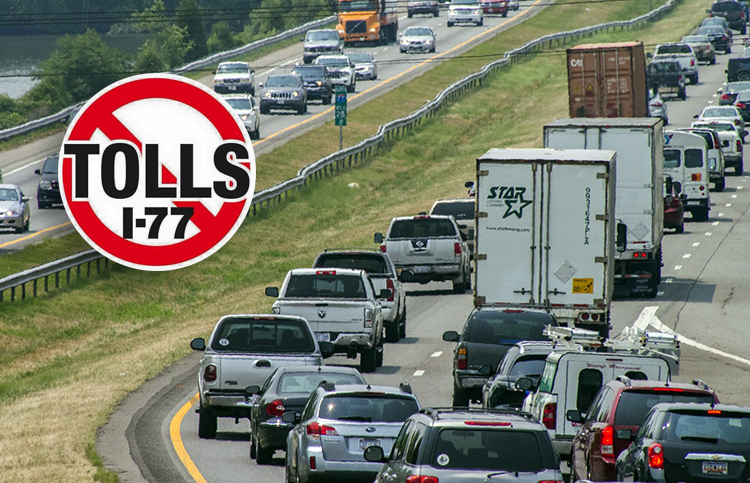 The more scrutiny of the contract, the more likely we will see some positive changes to the I-77 toll lane debacle,” said Huntersville Mayor John Aneralla. The most hoped-for outcome—in the business community at least—seems to be “complete and delete,” which means Cintra finishes the 18-mile project and the state pays not only for the construction but to delete or cancel the contract. The I-77 toll lane advisory group will be comprised of 11 members, with representatives from Huntersville, Cornelius, Davidson and Mooresville; Mecklenburg and Iredell counties; the chambers of commerce for Charlotte, Lake Norman, Huntersville and Mooresville-South Iredell and the City of Charlotte. “Debacle” is putting it mildly. The convoluted, 900-page Cintra contract—which imposes toll lanes on I-77 between Charlotte and Mooresville for the next 50 years—brought down Gov. Pat McCrory in the general election last year. It also brought down Huntersville Mayor Jill Swain the year before. But in a bizarre twist that only state government is capable of, Swain herself will be a member of the advisory board—simply because she launched her own anti-chamber, the Huntersville Chamber of Commerce, soon after losing the election to Aneralla, a staunchly anti-toll candidate who soundly defeated Swain two years ago. Her chamber, meanwhile, has accepted sponsorship funds from Cintra. Of course, the Lake Norman Chamber has been part of the anti-toll movement, so having Swain on the advisory board is like having McCrory on it. Former Lake Norman Chamber Chairman John Hettwer will be the chamber’s representative on the advisory board. The DOT wants the members named by Dec. 4, a speedy timetable for a bureaucracy which has been better known over the years for dragging its collective body parts. N.C. Sen. Jeff Tarte, who is asking the mayors of Cornelius, Davidson and Huntersville to call for a vote by the Charlotte Regional Transportation Planning Organization to terminate the Cintra contract, says that the I-77 advisory group will stay in place indefinitely or until the group is either not needed or no longer effective. “State Legislators will not be part of this group. However, local elected officials may be members,” Tarte added. Mecklenburg County Commissioner Jim Puckett suggested the idea to create such a group after meeting with Gov. Roy Cooper. “He and Secretary Trogdon would never have gotten into this and they would like to find a good way out of it,” Puckett said. One of the options under consideration will be the “complete and delete” option backed by many Lake Norman toll-lane opponents. In that scenario, the contractor, I-77 Mobility Partners, will complete the construction of the toll lanes from Charlotte to Mooresville. Thereafter, the state would buy out Cintra and take over the project. It’s unclear whether all the new traffic lanes would be converted into free, general-purpose lanes under this option, but in any event it would be expensive.